Canadian super-trio Mounties previously dropped some hints to Exclaim! about their upcoming Thrash Rock Legacy album, and now they've officially announced the LP. It will arrive on March 4 through Light Organ Records, and it will be followed by a Canadian spring tour. 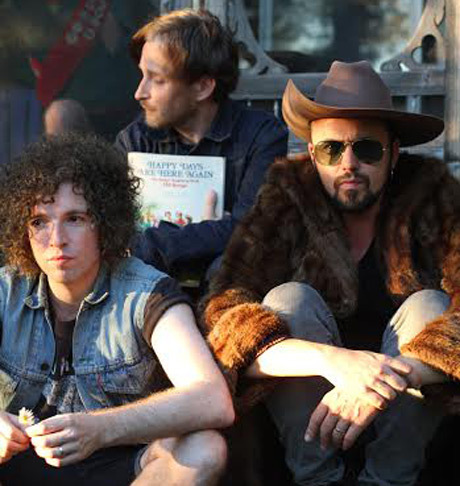 The album was recorded by collaborators Hawksley Workman, Ryan Dahle (Limblifter) and Steve Bays (Hot Hot Heat), partly in Vancouver and partly in rural Ontario. Some of it was recorded together, while other parts were worked on remotely. The band previously told Exclaim! that the songs were written by editing together pieces of lengthy jam sessions. "When there's a hook that starts to materialize, everybody's mind goes into emphasizing that hook," Workman said. "So when we're listening back to an hour's worth of playing, it's not about guitar solos and drum solos and extravagance. It's really about mining those moments that are hooky enough to become a song." They told Exclaim! that album was named after a photo belonging to Dahle that shows a motorboat called Thrasher Rock. As for the band's tour plans, they will be on the road for around two and a half weeks this coming March and April. The outing will kick off with a Western Canadian leg with Rich Aucoin; this will be followed by an Ontario jaunt with the Zolas. Read an interview with Mounties about their debut LP here.